Thirteen Centre County high school students awarded $8,596 to five local nonprofits at the conclusion of their year-long participation in Centre PACT (Philanthropic Actions Created by Teens), a program of Centre Foundation. Recipient organizations included: Out of the Cold, Central Pennsylvania Community Action, AIDS Resource Alliance, Housing Transitions, and Center for Alternatives in Community Justice. In October, the students kicked off the program by selecting the theme of “Securing Physical and Emotional Safety for Community Wellness.” Over the course of the program, they created their own grant application, sent out a request for proposals, reviewed twenty competitive applications, and solicited donations—all of which guided their granting decisions in April. The students began the program with $2,253, which was provided by a fund designated to Centre PACT. They then raised $6,161 from 43 community supporters. 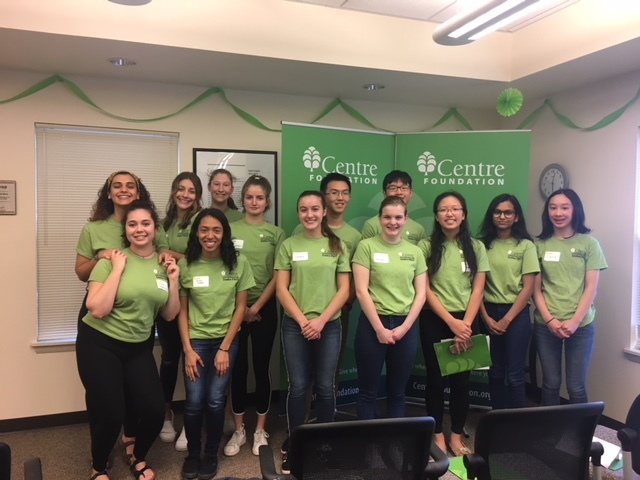 On Sunday, April 29, students, parents, donors, and nonprofit representatives gathered at Centre Foundation’s office for the check presentation party. To start the evening, Kunkel introduced Hope Bodenschatz, the Centre PACT program coordinator, who was a member of the first Centre PACT class and is now a sophomore at Penn State. Next, Centre PACT students Jasmine Cao and Jackie Feffer explained the program’s mission to the audience. Check presentations followed. Woojin Lee and Sanjana Kuchipudi presented $2,015 to Kendra Gettig of Out of the Cold to help them provide homeless guests with safe transportation to medical appointments, work, and more. Saoirse Hopp, Grace Handler, and Abby La Porta presented $2,015 to Susan Hawthorne and Donna Gill of Central Pennsylvania Community Action for their Freedom Program, which will provide victims of domestic abuse and sexual assault with a variety of services, such as counseling, financial support, clothing, workforce training, nutrition, and more. Bea Belmonte and Brontë Clingham-David presented $1,120 to Wes Chicko of AIDS Resource Alliance for their mental health counseling program, which will provide 35 hours of in-house mental health counseling to 12 clients. Claire Jin and Baron Cao presented $1,500 to Ginger Cain and Jennifer Stahl of Housing Transitions for their Life Skills Training Program, which provides group outreach support to shelter residents in an effort to help them achieve a more independent lifestyle. Finally, Jackie Saleeby and Bella DiNallo presented $1,946 to the Center for Alternatives in Community Justice for their Youth Aid Panel, which allows juvenile first-time offenders to have charges dropped and court fines lessened in exchange for their completion of alternative service projects. Perfect attendance awards were also presented to Bea Belmonte and Brontë Clingham-David. The following graduating high school seniors were also recognized: Bea Belmonte (DePaul University), Brontë Clingham-David (Sarah Lawrence College), Bella DiNallo (Penn State University), Jackie Feffer (Harvard University), Grace Handler (Boston University), and Jackie Saleeby (University of Pittsburgh). Centre County high school students may apply to join the Centre PACT Class of 2018-19 during fall recruitment, which will open in August. For more information, please email Shalen Perehinec at shalen@centre-foundation.org or call the office at (814) 237-6229.